The four answers people typically give when you ask what their goals pertain to are: building a company, getting a great job, finding a significant other, and being healthy. But why? Why do you want a great job? To make money. Why do you want to make money? Because you believe that will make you happier. 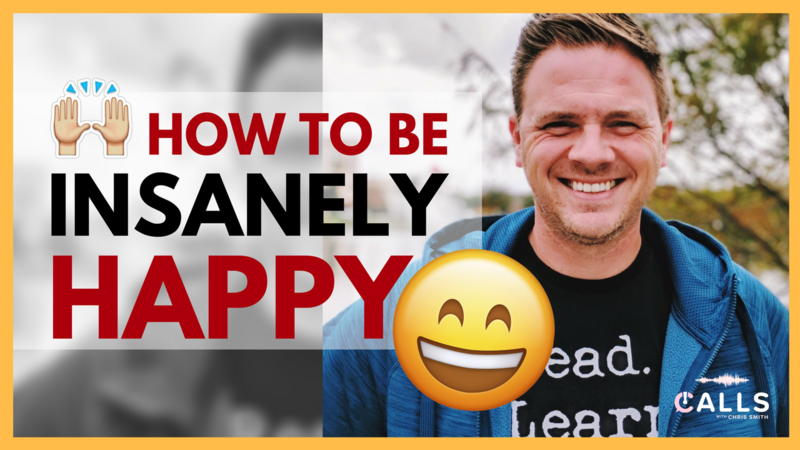 Whatever your high-level goal is — whether it’s health, income, spouse, or career — your low-level goal, if you just ask yourself, “Why do I want that?” comes down to this idea that you want to be super happy. So my challenge to you this year is: Make your one — and only — resolution to be as happy as possible. There’s a really good study by Princeton, and what they found was that about $75,000/year is the sweet spot when it comes to financial gain equating to increased happiness. So if you’re making $20,000 a year and you can double it to $40k or increase it to $60k, there’s a tangible increase in your day-to-day mood. But there’s not much of an increase in happiness beyond that amount of income. Another thing they broke down in that study is that there are two types of happiness. One is your day-to-day mood, and the other is a deeper satisfaction that your life is going the right way. What they found is that even if you hit the magical $75k/year it improves that deeper life satisfaction — but, you don’t wake up in a more jovial mood. So it’s important to understand that if you’re not happy right now, it probably goes a lot deeper than your income. This brings me to the second study I took a look at from Harvard. They tracked the same group of men for 80 years. Basically, from 1938, they’ve been meeting with the same group of men every two years. Half of the people that they met with were from the inner-city, with very low income and not many socio-economic advantages, and the other half were Harvard students. So, every two years they would ask this group about their physical and emotional health, employment, family, and friends. What they ended up finding was that it wasn’t money or status that determined a good life. The people that were the happiest and the healthiest stated that it was strong, interpersonal relationships that made them feel better. The people that were isolated were the ones that declined in mental and physical health. So a deep set of personal relationships is actually what led to happiness — and everybody could have that right now. The ability to have great relationships is already there for you! George E. Vaillant was asked, “Ultimately, over 80 years, what did you learn from this study?” And he said, “The only thing that really matters in life are your relationships to other people.” So I want you guys to think about that — relationships with other people equate to happiness. There’s a great Ted Talk with 18 million views about this study as well: What makes a good life? Lessons from the longest study on happiness. I’m sure some of you have some friends on social media where they really want you to think they’re happy. This happens a lot with couples. There’s a great article on Inc. about how the happiest couples rarely post online. It’s a great read —8 Reasons Why Happy Couples Rarely Share Their Relationship Statuses on Social Media. Sometimes the more you share, the less you actually care. The last thing I’d like to talk about is: How does all of this impact your work life? And what are some of the action items you can take with you to make 2018 your happiest year ever? I really, truly believe that the more effort you put into deep and meaningful relationships with your coworkers, the more you’ll enjoy your job — and there’s a lot of data behind this: 54% of employers feel that strong work relationships improve culture, 36% of people that have a friend of work say that they enjoy going to work and feel more valued and productive, and close work friendships boost employee satisfaction by almost 50%. Think about your happiness as you tackle your goals for 2018 and beyond.